Bath is one of the most renowned cities in the world for architecture. Millions visit every year seeking to marvel at its quaint streets, grand Georgian buildings and detailed facades. Sash windows are one of those iconic features you’ll see across the city, with many attributing them to Georgian design. But the sash window has a much deeper history, with its origins beginning in the early 17th century. Throughout the early medieval period, the great majority of windows were unglazed. Glass was extremely expensive and rare, and windows were simple openings in the structural frame of the timber buildings. While timber shutters were widely used for security and privacy, it wasn’t until the late medieval period, and into the 17th century, that glass started to be used for ordinary domestic buildings. During this time, windows also became more sophisticated with wooden tracery, moulded mullions and deep projecting sills. In the I7th century, the side hung hinged casement window was one of the most common designs seen throughout buildings in Europe. But, with the development of glass and the ability to source larger and clearer sheets, this design started to fade. It was then that the wooden sash window became the more fashionable design. Initially, the design featured horizontally sliding sashes. Commonly referred to as the Yorkshire sliding sash window, its design became very popular because it could be left slightly open even in poor weather without being damaged or letting in rain. However, this design was soon surpassed by the vertically sliding sash window due to aesthetics. The earliest vertically sliding sash window had a fixed top sash. The lower sash slid upwards in a groove and was either wedged in position or held by pegs inserted into holes drilled in the frame. By the start of the 18th century, this was surpassed by the double hung sash window thanks to the invention of the ingenious counter-weighting mechanism. This technological breakthrough enabled a far more subtle and sophisticated system of ventilation that was never possible before. The earliest surviving double-hung sash dates from around 1701; but by 1720 its design gained international proclaim, spreading as far as Holland and the British and Dutch colonies. Early examples were usually flush and exposed against the brick, but this soon changed in part due to the introduction of Building Acts and the development of glass. 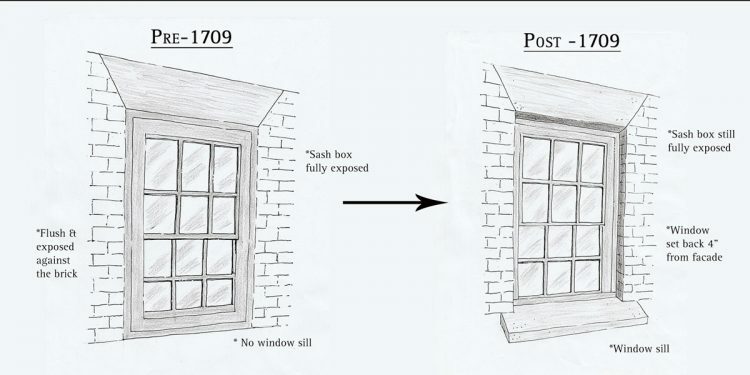 In 1709, as a precautionary measure against the spread of fire, the 1709 Building Act required corners of sash box frames to be hidden behind the face of the wall, set back by four inches. This was then changed once more in 1774, requiring the outer boxes to be recessed by nine inches. While this legislation was only applicable to the cities of London and Westminster, the styles they produced became fashionable and spread throughout England within about twenty years. While windows of the late 17th century could be quite large, in the early 18th century they were relatively small, with thick glazing bars and small panes of glass. By 1730 gauged-brick arched windows had largely been replaced by square-headed varieties that were cheaper to make. The glazing patterns inserted into these frames often took the form of six panes over six, a design popular in the city of Bath. Like the Georgian buildings they were inserted into, these six over six pane windows often followed the Golden Ratio. It is thought the golden ratio is integral to classical architecture. First officially recorded by the mathematician Euclid in his book ‘Elements’ in 300BC, the golden ratio consists of two quantities (1 and 1.168). When put into practice, architecture in this ratio is thought to be the most pleasing to the human eye. It was this ratio that was influenced much of Bath’s architecture—including the windows. Glass developed extensively throughout the Victorian period. It became cheaper to produce and could be made in larger panes. Cylinder glass was the popular choice, and Britain began to produce its own in the mid-1800s. Improvements in technique then permitted both cost reductions and larger sheet sizes. 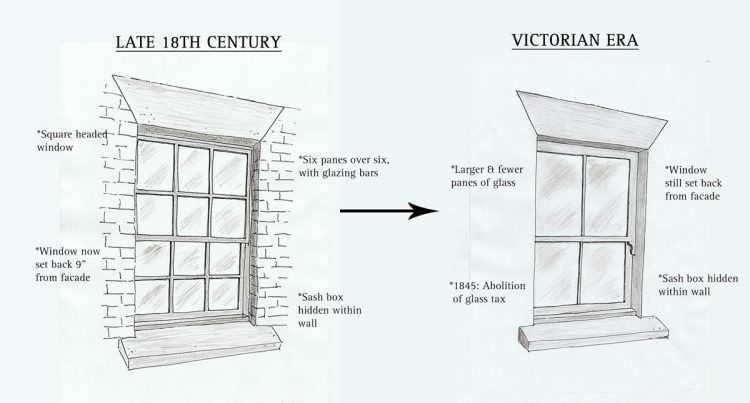 In 1845, the abolition of the tax on glass (introduced in 1746) also meant that sash windows could contain larger, and therefore fewer, panes of glass. Due to this, many homeowners converted their six over six panes to two over two or one over one pane sash windows. This was popular at the time as it allowed a clearer view to the outside. Sash windows are still an extremely popular style in today’s architecture. But they have come a long way. Most now feature modern day draught proofing technologies, and many are fitted with double glazing to meet the thermal efficiency demands of the 21st century. While there are still strict guidelines on sash windows in listed properties, we are making great progress in future proofing our heritage. 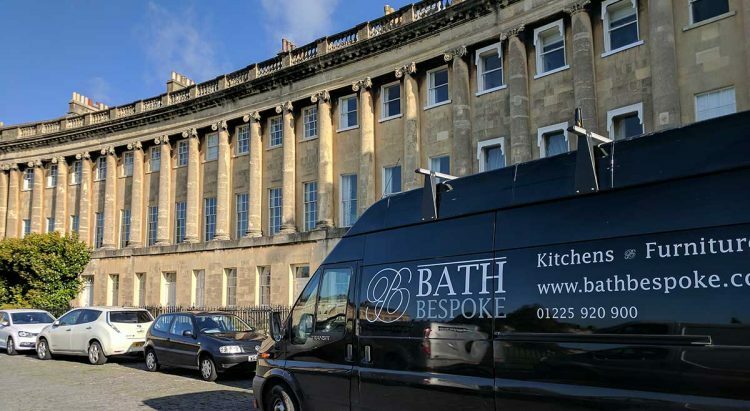 Recently the team completed a sash window restoration project on the Royal Crescent and you can see our work throughout Brock Street, The Circus and Belvedere. Get in touch if you have any questions on 01225 920900.